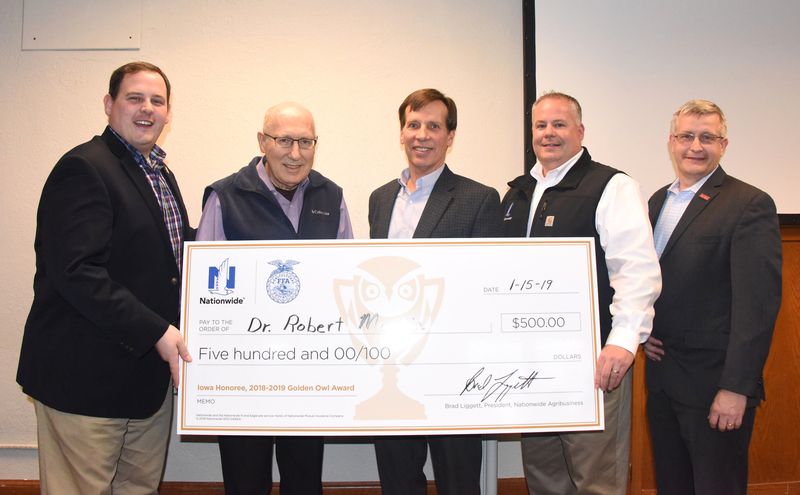 AMES, Iowa – Robert Martin, an Iowa State University agricultural education and studies professor, was presented one of seven Iowa Nationwide Golden Owl Awards on Jan. 15. The new award was presented at Iowa State by Eddie Chestnut, the director of agribusiness for Nationwide, and Josh Remington, the Iowa FFA Foundation executive director. Martin was selected from 92 nominations in Iowa and is one of seven finalists in Iowa receiving the award. The honor recognizes his contributions in preparing students for successful careers in agriculture. Martin has served Iowa State students, staff and fellow faculty as an educator, adviser and mentor since 1983. His classes inspire students to practice and demonstrate concepts through experiential learning. He has received numerous teaching awards and served on several university, state and national educational committees. Martin began his teaching career in Nigeria and taught vocational agriculture in Indiana before coming to Iowa State in 1983. Prior to his work at Iowa State, Martin held academic appointments at Purdue University and Pennsylvania State University. Martin teaches courses in presentation methods, adult education, technology transfer, administration and comparative international education. Martin has coordinated and directed the Annual Teacher’s Academy on Agricultural Awareness and he currently assists in conducting a series of workshops on biotechnology education offered by Iowa State. He also served as chair of the agricultural education and studies department for 12 years and most recently helped students develop and publish the CALS Connections newsletter. The seven Iowa finalists were presented a $500 cash prize and are eligible to become a grand-prize winner, which will be announced in April. The grand-prize winner will receive a Golden Owl Award trophy, the designation of Ag Educator of the Year and a $3,000 Nationwide-funded cash award designed to help support continued education efforts. Nationwide established the Golden Owl Award to honor contributions of agriculture teachers and the importance of agricultural education for future industry leaders. The awards are the result of a partnership between Nationwide and the Iowa FFA Foundation. Robert Martin, an Iowa State University agricultural education and studies professor, was presented with one of seven Iowa Nationwide Golden Owl Awards on Jan. 15. The award includes a $500 gift. Pictured from left are Josh Remington, the Iowa FFA Foundation executive director; Robert Martin; Eddie Chestnut, the director of agribusiness for Nationwide; Jade Rodemeyer, sales manager of agribusiness for Nationwide; and Mike Retallick, chair of the agricultural education and studies department.